Mayor Antonio Villaraigosa, at left, and MTA Board of Director Chairman Ara Najarian. Photo by Luis Inzunza. 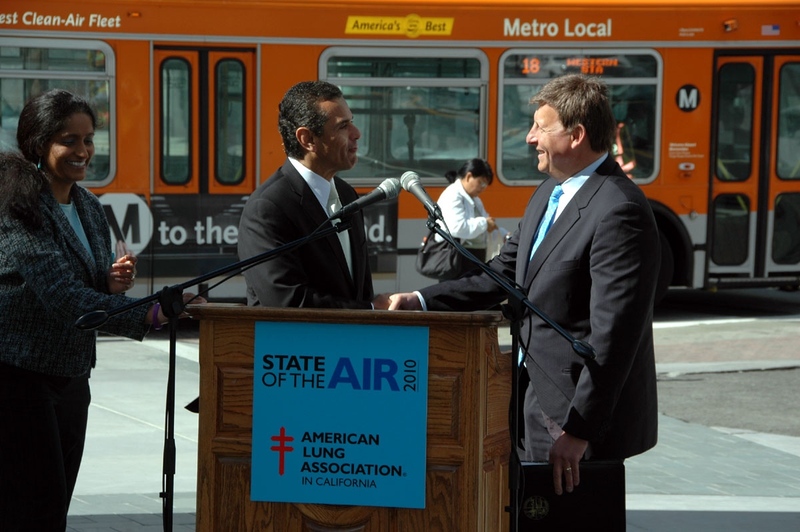 Metropolitan Transportation Authority Board of Directors Chairman Ara Najarian and Los Angeles Mayor Antonio Villaraigosa participated in a news conference this morning about the release of the American Lung Association’s annual “State of the Air” report. It was a bad news/good news type of affair. The bad: The Los Angeles metro area leads the nation in the number of bad ozone days (ozone is a leading ingredient of smog), but the number of such days has dropped in the past decade. Najarian’s comments are below. Villaraigosa pointed out that the 30/10 Initiative that the Board of Directors adopted last week would accelerate transit construction and help get more cars off the road. On a related note, here’s a link to a recent post on The Source that compares greenhouse gas emissions from mass transit to private vehicles. Transit wins, hands down, in most cases. THE 2010 STATE OF THE AIR REPORT IS A WAKE UP CALL TO ACTION FOR EACH OF US TO DO OUR PART IN REDUCING TRAFFIC CONGESTION AND CLEARING THE AIR WE BREATHE. AS YOU HAVE HEARD THIS MORNING TRAFFIC CONGESTION IS A LEADING CAUSE OF POOR AIR QUALITY AND POLLUTION. VEHICLE USE ACCOUNTS FOR 50 PERCENT OF THE AIR POLLUTION NATIONWIDE. AND THAT POLLUTION IS TAKING A HUGE TOLL ON THE PUBLIC’S HEALTH. MTA IS PART OF THE SOLUTION. WE’RE GETTING COMMUTERS OUT OF THEIR CARS AND ONTO PUBLIC TRANSIT OR GETTING THEM TO SHARE A RIDE IN A CARPOOL OR VANPOOL. WE ALSO DO A LOT TO MAKE LOS ANGELES MORE BIKE AND PEDESTRIAN FRIENDLY. AND WE HAVE THE LARGEST CLEAN AIR BUS FLEET IN THE NATION. MORE THAN 2,500 OF OUR BUSES RUN ON COMPRESSED NATURAL GAS, AND OUR TRAINS ARE ELECTRIC. OUR BUSES, ALONE, REDUCE DAILY AIR POLLUTION OVER LOS ANGELES BY 75 TONS. ENOUGH PEOPLE RIDE METRO BUSES AND TRAINS TO TAKE 320,000 CAR TRIPS OFF THE ROAD DAILY . AND WE’RE ON A ROLL. WE HAVE MORE THAN A DOZEN NEW RAIL AND BUS RAPID TRANSIT PROJECTS IN THE PIPELINE PLUS WE’RE EXPANDING CARPOOLING AND VANPOOL OPPORTUNITIES. IN ADDITION, NEW HOUSING, HOTELS, STORES AND ENTERTAINMENT COMPLEXES ARE BEING DEVELOPED AROUND METRO RAIL STATIONS MAKING IT EASIER FOR PEOPLE TO PARK THEIR CARS AND TRUCKS AND LET MTA DO THE DRIVING. BUT WE CAN ALL BE PART OF THE SOLUTION. AN INDIVIDUAL SWITCHING TO PUBLIC TRANSIT CAN REDUCE HIS DAILY CARBON EMISSIONS BY 20 POUNDS OR 4,800 POUNDS OF EMISSIONS ANNUALLY. AT MTA, WE’RE COMMITTED TO CLEANING THE AIR AT THE SAME TIME WE’RE EASING TRAFFIC ON THE GROUND. I APPEAL TO THE PUBLIC TO JOIN US IN THIS VITAL COMMITMENT BY USING OUR SERVICES AND SHARING A RIDE SO WE CAN ALL BREATHE BETTER. Metro Mentions: take the Red Line to kickball!